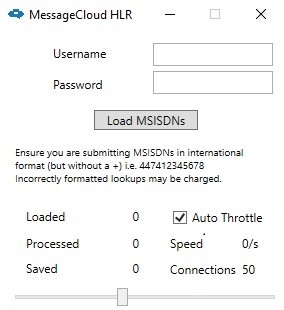 Using MessageCloud's HLR desktop app you can perform Home Location Register (HLR) Lookups directly from your personal computer with just a few clicks. Lookups are requested securely using your MessageCloud SMSC account credentials. If you are using Apple Mac or Linux simply use a free windows emulator such Winehq for Linux or Winebottler for MAC. Firstly download MessageCloud's HLR desktop app and follow Install Wizard and proceed through the setup process. Statistics - will appear once your file is uploaded, this needs to be CSV (Comma delimited) (*.csv) file type with each number on a separate row. Saved - how many have been processed and saved into the new spreadsheet containing the results>The file is complete when the Saved total equals the Loaded. Browse the folder from where you uploaded the raw file and you will see a file with the same name with "-results" appended. View Results, open the file with "-results" appended to view the HLR data. How many can I load? We have tested over 500,000 without any issues, however, as this can take some time to process (500,000 divided by 1000 per minute = 8.33 hours) for this kind of volume you might like to consider splitting the file and running on two separate PC's using the same account credentials. What data do you return? Can you return the location of the phone? The current country where the phone is located is returned. If a user is roaming you will be able to see their home country and the country where their phone is roaming. If you require a more precise location the Cell ID (CID) or Location Area Code (LAC) can be used to geo-locate users within a country. This can be possible on certain routes, however due to data protection, has restrictions. Please contact MessageCloud for a list of countries where CID and LAC is supported. Please contact your MessageCloud account manager for pricing. How do you get the results? MessageCloud works with many network operators throughout the world and has interconnect agreements that makes performing HLR lookups possible. This depends on the route, please contact your account manager or log a ticket via help@messagecloud.com for the meaning codes relating to the route you are using. Can you whitelabel the desktop app? Yes, MessageCloud are a leading wholesale aggregator and many companies providing HLR throughout the world use our Tier 1 connections. Please contact your account manager for details on how easy it is to use a whitelabel version of our desktop app, self branded so you can distribute it to your clients.